Indoor rowing is a great workout, and the SportPlus SP-MR-009-iE Rowing Machine is one you should check out. This rowing machine doesn’t only provide an intense and effective workout, but it also allows you to track your progress quickly. Through the Cardio fit app, you’ll be able to create your profile and use the pre-defined training programs. You can also save your own route plans through Google Maps, Street View, and a lot more. 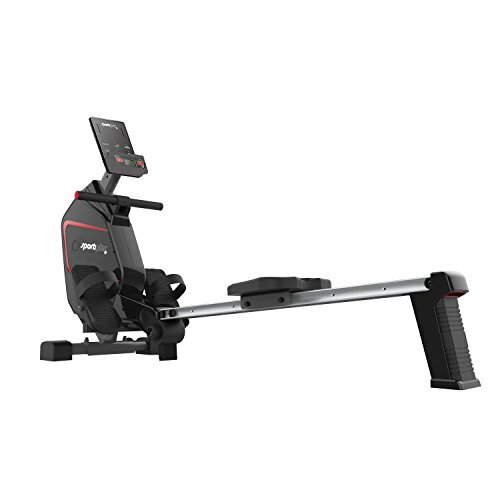 There are a lot of rowing machines available on the market today that are integrated with advanced technology. So, how does the SportPlus SP-MR-009-iE Rowing Machine sets itself apart from the rest of them? The Cardio fit app helps you do your best possible workout with every session. 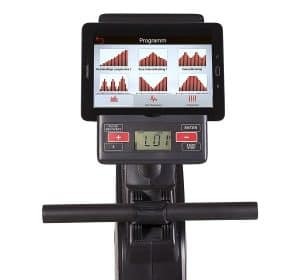 Once you connect your tablet or smartphone to the SportPlus SP-MR-009-iE Rowing Machine, your progress will automatically be recorded in your app user profile. Through the Cardio fit app, you can view and manage your training history which includes the date, duration, distance, approximate calories consumption, speed and heart rate. This rowing machine has a built-in tablet holder for you to view all the fitness related data even during exercise. Through this helpful app, you can also create your own tracks on Google Maps and run them in street view mode. That means you won’t have to stare at the wall or the window whilst your exercise! It doesn’t only allow you to challenge yourself to go farther, but it also makes working out less boring. 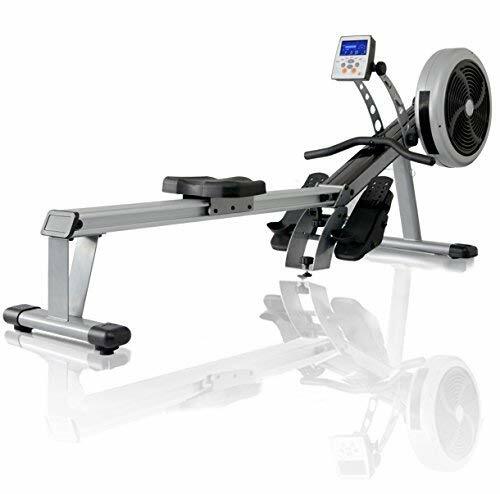 The SportPlus SP-MR-009-iE Rowing Machine has an extra long aluminium track that measures 110cm. Six-foot-tall users will be able to make the most out of their training sessions with this fitness machine. This model has a permanent braking system with an 8kg flywheel mass that operates with a maintenance-free and quiet belt drive. It also has 24-level controlled resistance adjustments to intensify your workout. Also, it has a maximum user weight of 150kg so it must be sturdy and durable. The chest straps are connected to the 5kHz pulse receivers to keep track of your heart rate. Aside from this, you can also use any of the four target heart rate programs (55%, 65%, 75%, 85%) integrated within the Cardio fit app. Through this, you’ll be determined to reach your target which will help get faster optimal results. Back then, building a home gym may seem to require a lot of space inside your house. But this is not the case anymore thanks to space-saving designs integrated into fitness machines, it’s now possible to have one even if you live in a small apartment. 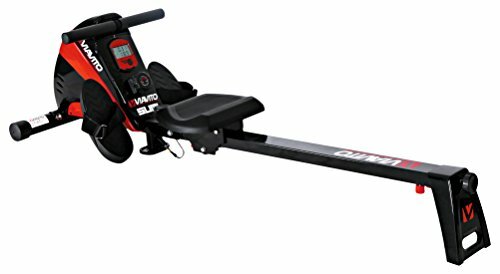 The SportPlus SP-MR-009-iE Rowing Machine has an extra long row length, large pedals and an 8 kg flywheel, but it’s foldable and can easily be moved around by its built-in transport wheels. The only problem with this rowing machine is that even if it’s foldable and easy to transport, it’s still quite bulky. That means it should be stored in a place where you won’t bump into it especially when the lights are off. 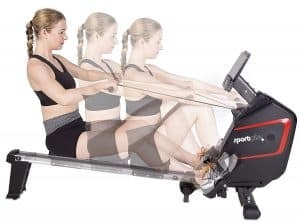 The JLL R200 Rowing Machine is more affordable than the SportPlus SP-MR-009-iE Rowing Machine so it could be a great choice if you’re on a tight budget. However, expect that it has some shortcomings when compared with the SportPlus rowing machine. This one is simple and straight-forward with ten levels of magnetic resistance. It has an LCD monitor that displays total counts, calories, distance, time, scan mode. However, it can’t monitor your heart rate, and it can only hold users with a weight of up to 100kg. If you want to know more about the JLL R200 Rowing Machine, we have our detailed review of it here. This rowing machine has a 7kg flywheel mass and ten levels of silent, frictionless magnetic resistance. It’s an Amazon UK choice for “rowing machines for home” which means its one of the market’s great buys. 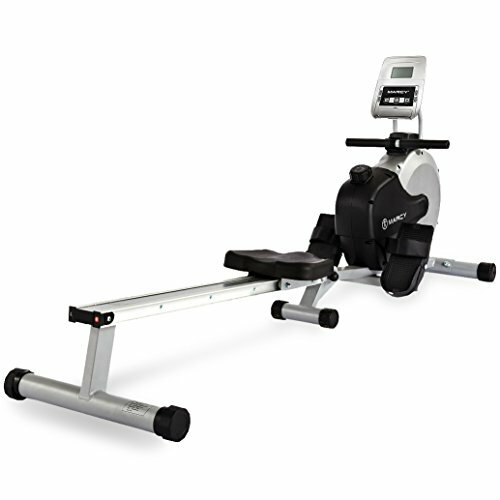 However, this model also lacks the advanced features that are integrated into the SportPlus SP-MR-009-iE Rowing Machine. It has an 80cm row length which is shorter than the Sportplus which has a 110cm row length. Nonetheless, it’s still an efficient rowing machine that has a maximum user weight of 120kg. It’s suitable for home use because it’s easy to assemble, foldable and has transport wheels. If noise isn’t an issue for you, try checking out the JTX Freedom Air Rower. The difference between air and magnetic rowers is the generation of resistance. Air rowers allow greater resistance as you row harder and faster. While magnetic rowers such as the SportPlus SP-MR-009-iE Rowing Machine uses magnetic breaks in the flywheel when adjusted so it won’t affect the resistance no matter how hard you pull. 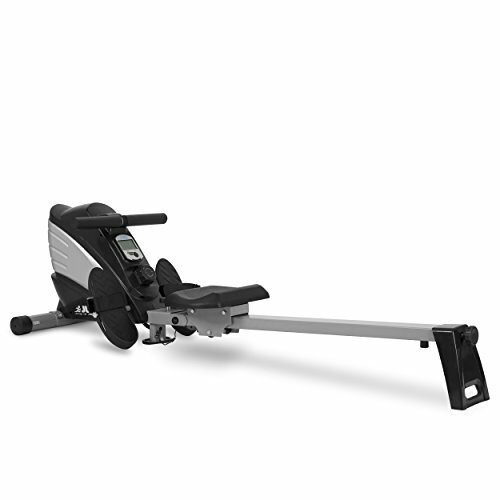 The JTX Freedom Air Rower has 16 levels of resistance and eight pre-programmed workouts. It comes with a chest strap to monitor your heart rate, and has a maximum user weight of 130kg. The Marcy RM413 Henley Magnetic Foldable Rowing Machine features a lighter flywheel mass that only weighs 4k whereas the SportPlus SP-MR-009-iE Rowing Machine has an 8kg flywheel. However, it’s still a great fitness machine for weight loss and body toning. It has eight levels of quiet magnetic resistance that can be adjusted through a tension dial. This foldable rowing machine has a maximum user weight limit of 110kg and has a large ergonomic seat pad. Rowing is a great cardio workout that brings a lot of amazing benefits to our bodies. It doesn’t matter if you’re trying to lose weight or just wanting to get in better shape, rowing machines can definitely help. The SportPlus SP-MR-009-iE Rowing Machine is a great investment for your home gym because it is fairly reasonable for its price. It’s integrated with advanced technology and has 24 levels of magnetic resistance whereas average rowing machines only offer up to 10 levels.